Gail Penberthy has done it again with her delightful fleece quilt featuring lots of different brightly coloured flowers. The quilt has clipped seams as in her other quilt Dolly Mixture and gives it a wonderful tactile feeling that nobody can resist stroking. 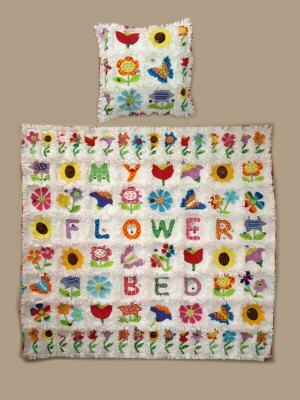 The quilt reads 'My Flower Bed' and measures approximately 50 x 50 inches and also includes the pattern for the cushion too.